Cherry limeade bars are punchy with lime flavor, but the cherry adds a sweet hit and a lovely pink color. Sweet and sour summery perfection! Guest Post: Recipe and photography by Mary Haymaker of Chattavore. When she’s not cooking, writing, taking pictures of food, or eating (or trying to figure out how to button her jeans), Mary works as a behavior analyst in Chattanooga, Tennessee. Her blog focus is on modern Southern food with as few processed ingredients as possible and Chattanooga-area restaurants. Maybe it’s the tropical association, but there’s no flavor profile that more accurately defines “summer” for me across the board than citrus. Since I was a kid, I have loved desserts that showcase citrus flavors, whether lemon, lime, or orange (grapefruit was never my jam). I am sure the employees at my little hometown ice cream shop thought I was the oddest child when I ordered lemon custard ice cream instead of Superman (multi-colored vanilla flavored ice cream that everyone else was obsessed with and I never understood. Lemon bars? Yes. Please. And thank you. Key lime pie? Yaaaaasssss. My grandmother would regularly make it for me. Orange cake from a box even. So good. And then…then there are cherries. The little red orbs are just so gorgeous, so tempting…sadly, the cherry tree in my front yard just refuses to produce edible fruit, instead serving up hard little berries as if we’ve done something to deserve such torture. Our neighbors have a very fertile cherry tree in their yard and it makes me so jealous to watch them go out and gather gigantic colanders full of them every day for weeks at a time. Lucky for us, they are willing to share, granted I am willing to make a batch of cherry jam and give them half the jars. Happily I oblige. It occurred to me that I needed to merge the two. Citrus and cherry…how should I do it? Then I thought of Sonic Cherry Limeades…I mean, who doesn’t love to slurp down a Route 44 from time to time? What a perfect flavor combination. Why not make them into cookies-cool, creamy cherry lime bars? Sounded like a perfect plan to me. Turns out it absolutely was a perfect plan. This recipe is so simple…everything comes together in the work bowl of your food processor, and you can make the filling while the crust bakes. 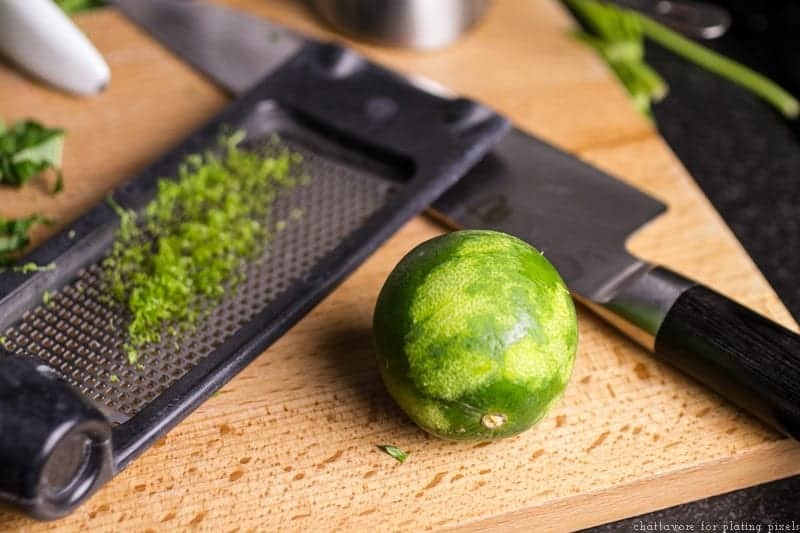 There’s no juicing involved either…you slice up the lime and toss it in the food processor too! 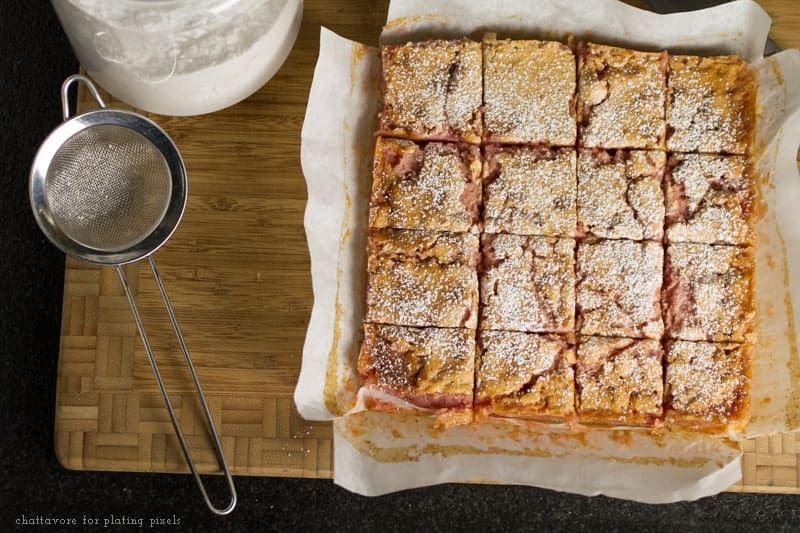 With lime zest and juice, these cherry limeade bars are punchy with lime flavor, but the cherry adds a sweet hit and a lovely pink color. Sweet and sour summery perfection! 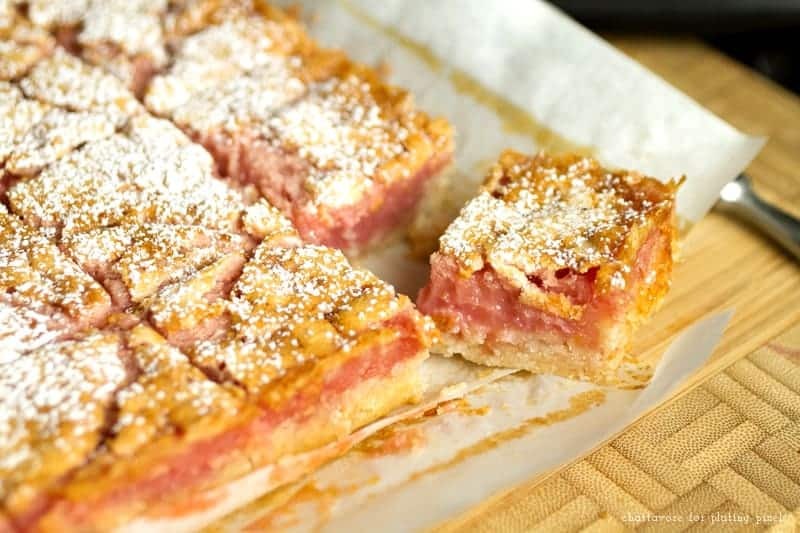 Cherry Lime Bars. 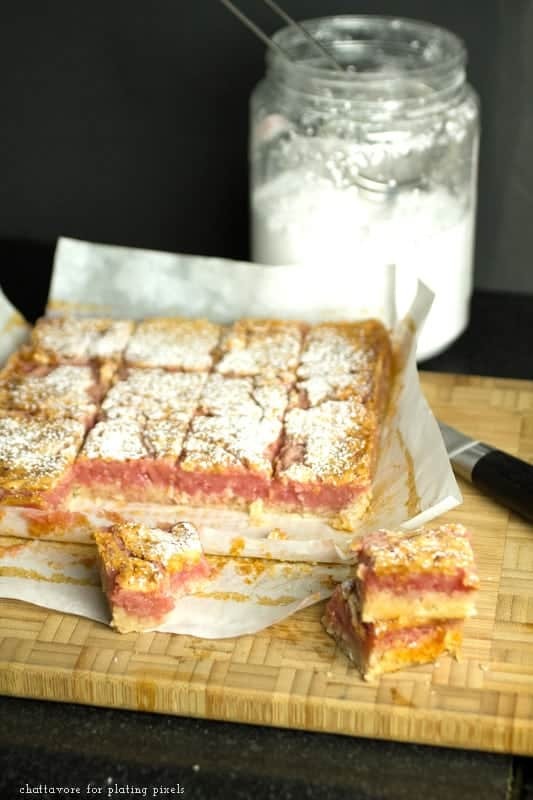 Tangy citrus and sweet cherry in the dessert bar recipe. Place a rack in the center of the oven and preheat the oven to 350 degrees. Line an 8-inch square baking dish with two 8-inch wide strips of parchment paper facing opposite directions to make a "sling". Butter the parchment paper. Place the crust ingredients into a food processor and pulse until the mixture resembles coarse crumbs and sticks together when you press between your fingers. Scrape into the prepared pan and use your fingers or the flat bottom of a dry measuring cup to press the crust into the pan and smooth it out. Bake for 20 minutes, until lightly browned. Leave the oven on when you remove the pan. While the crust is baking, wash the food processor. Zest the lime and place the zest into the food processor. Cut the pith (white under the lime zest) away from the lime and discard. Cut the lime flesh into thin slices and place into the food processor. 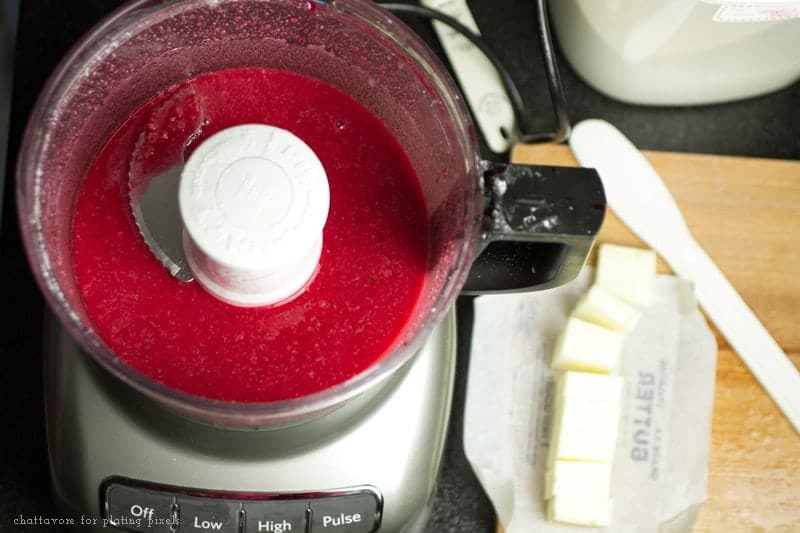 Place the cherries and the sugar into the food processor with the lime flesh and zest. Process on high until smooth, about two minutes, scraping down the sides of the bowl as needed. Add the butter and purée until smooth, scraping down the sides of the bowl. Add the eggs, the cornstarch, and the salt to the lime-cherry mixture and pulse, scraping down the sides, until well-blended. Pour into the crust and bake for 35-40 minutes, until center jiggles just slightly when the pan is jostled. Remove from the oven and cool completely. Cut into 16 squares and sprinkle with powdered sugar before serving if desired. Have you cooked in a slow cooker? What type’s of dished do you like to make? These turned out beautifully. I substituted coconut oil for butter in the filling. Recipe doesn’t mention where to add this ingredient–I whipped in after the cherries. Thanks for the tip and catching that Kendra! The guest poster emailed me as well so I fixed for her. Glad you liked them! Thanks Richa! I hope they do too! What a great idea to make a classic summer drink into a sweet treat! I know, how fun! I don’t have a Sonic near me so it’s a good alternative. Plus it’s a dessert bar, can’t beat that. Thanks Marly! I’ve never tried anything like this… it sounds delicious and that texture looks like pure heaven! You and me Chelsea. I’m a huge fan of crumbed dessert bars. Thanks! What a beautiful bar dessert! I love cherry limeade! I agree, such a strong flavor combo! Thanks Sabrina! Oh, this looks so, so yummy! And it seems so easy to make. Thanks Tirralan! It does and dessert bars are always so fun and easy to enjoy! Thanks Lauren! I’ve never had that, but now I want it and these. Thanks! This definitely looks like something I want to make. The colors are so appropriate for summer, too! I agree Zully! I hope you do and have a wonderful summer as well. Thanks! Thanks Colleen! The post came out great and was happy to have her on the blog. I did a guest post on her’s that will publish this week too. These are great bars! I like the combination of cherry and lime 🙂 I just wish we had lime here. Thanks Winnie! It’s a fun combination, perfect for summer.